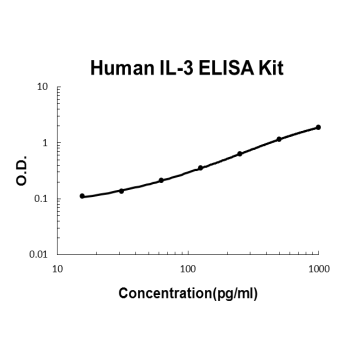 Sandwich High Sensitivity ELISA kit for Quantitative Detection of Human IL-3. 96wells/kit, with removable strips. Activated T-cells, mast cells, natural killer cells. Granulocyte/macrophage colony-stimulating factors are cytokines that act in hematopoiesis by controlling the production, differentiation, and function of 2 related white cell populations of the blood, the granulocytes and the monocytes-macrophages. The gene IL-3 encodes interleukin 3, a hematopoietic colony-stimulating factor(CSF) that is capable of supporting the proliferation of a broad range of hematopoietic cell types. Interleukin-3(IL-3), a protein of 140 amino acids, is chemically synthesized by means of an automated peptide synthesizer and is shown to have the biological activities attributed to native IL-3. The cDNA sequence for murine interleukin-3, one of the colony stimulating factors that regulate haematopoiesis, codes for a polypeptide of 166 amino acids including a putative signal peptide. The mouse IL 3 gene is located on chromosome 11. The human gene encoding IL 3 is tandemly arrayed on the long arm of chromosome 5. The standard product used in this kit is recombinant human IL-3, consisting of 133 amino acids with the molecular mass of 15KDa.